Unfortunately, the e-mail response to Swansea council said in Welsh: “I am not in the office at the moment. Send any work to be translated”. So that was what went up under the English version which barred lorries from a road near a supermarket. “When they’re proofing signs, they should really use someone who speaks Welsh,” said journalist Dylan Iorwerth. Swansea council got lost in translation when it was looking to halt heavy goods vehicles using a road near an Asda store in the Morriston area. 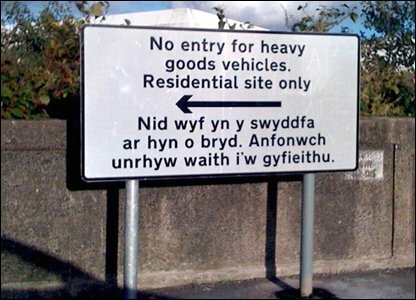 All official road signs in Wales are bilingual, so the local authority e-mailed its in-house translation service for the Welsh version of: “No entry for heavy goods vehicles. Residential site only”. The reply duly came back and officials set the wheels in motion to create the large sign in both languages. The notice went up and all seemed well – until Welsh speakers began pointing out the embarrassing error. Welsh-language magazine Golwg was promptly sent photographs of the offending sign by a number of its readers. Managing editor Mr Iorwerth said: “We’ve been running a series of these pictures over the past months. “They’re circulating among Welsh speakers because, unfortunately, it’s all too common that things are not just badly translated, but are put together by people who have no idea about the language. “It’s good to see people trying to translate, but they should really ask for expert help. “Everything these days seems to be written first in English and then translated. A council spokeswoman said: “Our attention was drawn to the mistranslation of a sign at the junction of Clase Road and Pant-y-Blawd Road. • Cyclists between Cardiff and Penarth in 2006 were left confused by a bilingual road sign telling them they had problems with an “inflamed bladder”. • In the same year, a sign for pedestrians in Cardiff reading ‘Look Right’ in English read ‘Look Left’ in Welsh. • In 2006, a shared-faith school in Wrexham removed a sign which translated the Welsh for staff as “wooden stave”. The dumping prices are shocking. I don’t understand why no one fights against it. And websites allowing dumping prices aren’t better! How can someone living in the EU compete with people living in third world countries??? We need websites that exclude dumping prices. To work on an assembly line is even better. E-mail error ends up on road sign – BBC News. This news teaches us a lot. No 01 Media Channel of the World, with proper update. It’s a shame to see such road signs! Why the hell they had to translate it at all. Everything because of the pursuit of “chip serveces” (original spelling from one of my documents to translate! ), I guess.